Businesses need to know where their customers are coming from. 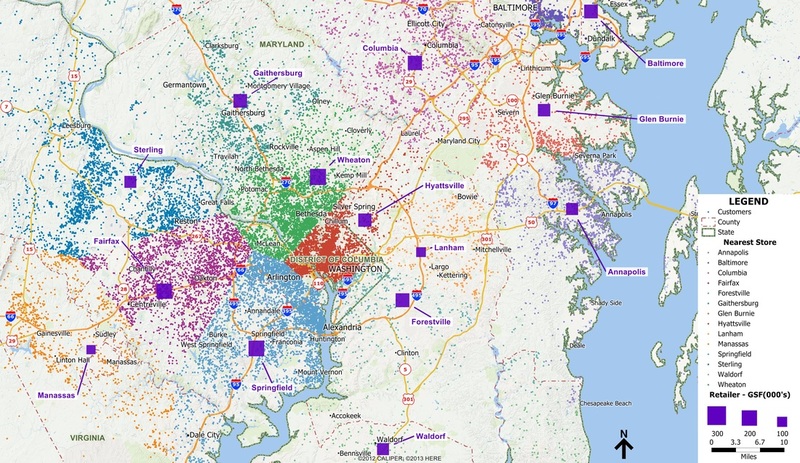 Cardinal Geographics, through the use of customer mapping techniques, can show business or organizations which geographic areas are serving customers best. The trends that were otherwise unknown can now be shown through spatial analysis. To leverage the greatest value from Customer Mapping, combine it with market share analysis to the show the areas with the strongest reach. Provide us your business location data (i.e. an Excel Spreadsheet), and we can map it! This example shows the primary customers for each store location for a particular retailer. Through feature tagging, we can automatically geocode each customer to their closest store geographically. Using this method along with other Trade Area Analysis procedures, a store at a particular location can determine if their customers have to travel further than customers at nearby locations. This gives the retailer one indicator in determining if they are or are not serving their customer base and should either expand or relocate to another area.